manila fashion observer: Sticker Shocker! A $349 dress from H&M? 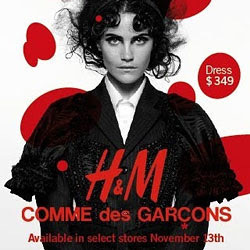 Why yes, because its Comme des Garçons for H&M! But still, definitely a shocker for H&M habitués who are used to paying $30 to $60 for a dress from the Swedish retailer. A great deal though for CdG lovers who now can wear something from Rei K. without having to shell out a fortune. Whichever angle you are coming from, this is good news for CdG fans. Stella, Karl and Roberto had to keep their prices on the down low, which kept both designer crazed and H&M fans very happy. Whereas Rei's pricing strategy will definitely weed out the noncommitals. Yay for Rei! You are one smart cookie! But wait, being the revolutionary designer that she is, will she now be setting this trend of mass retailer & designer collaborated pieces priced in the range of contemporary designer prices? Let's see how this catches on! I've posted a few pictures of the collection on my blog, and with a few prices. Hi. Please pardon my "using" your blog to advertise, but I've just put up a blog: http://cdginmanila.blogspot.com/ about CdG. I'm suddenly inspired to share my shopping. The prices are a little higher, but still much cheaper than going abroad to buy them. Many thanks.